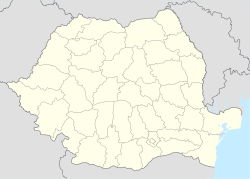 Băilești (Romanian pronunciation: [bə.iˈleʃtʲ]) is a city in Dolj County, Oltenia, Romania, with a population of 17,537. One village, Balasan, is administered by the city. The Romanian actor and comedian Amza Pellea and Romanian actor and theatre actor Marcel Iureș were born here and also Adriana Nechita, Georgiana Ciuciulete and Valerică Găman. In World War I, 156 people from Băilești died on the battefield; in 1924 sculptor Iordănescu constructed the Monument of Băilești Heroes in their honor. In World War II, 108 citizens of Băilești died on the battlefield. In 2001, Băilești was declared a municipality. The city has been expanding in the last years, lots of commercial centers have been built, banks and old buildings have been restaured. Wikimedia Commons has media related to Băilești. This Dolj County location article is a stub. You can help Wikipedia by expanding it. This page was last edited on 5 March 2017, at 15:04 (UTC).